Family fun aimed at Kuala Lumpur in 2020. Publisher Ubisoft has announced plans for a theme park based on their videogame properties. The park, which is planned to open in 2020 in the Malaysian capital of Kuala Lumpur, will be a joint venture between the Motion Pictures division of Ubisoft and theme park developer RSG. Ubisoft will design attractions and maintain creative control over the 10,000 square meter indoor park, while RSG will own and operate it. The move comes following recent success by Ubisoft Motion Pictures in the amusement park space. 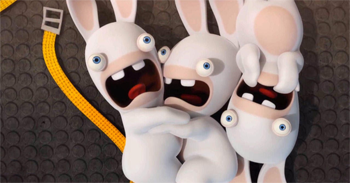 The Rabbids Time Machine ride designed by the division for French park Futuroscope has been credited with increasing attendance by as much as 15% and drew "Oustanding Achievement" honors from the Theme Entertainment Association earlier this year. Details regarding which properties under the Ubisoft banner might be reflected in the new park are yet to be revealed. Rabbids seems like a lock under the circumstances and the continuing popularity of Just Dance would suggest a likely appearance from that series too. Befitting their name, Ubisoft Motion Pictures is also currently at work with New Regency on an Assassin's Creed film (due in 2016 and starring Michael Fassbender), and has adaptations based on Watch Dogs and Tom Clancy's Splinter Cell in development as well.